Between 2014 and 2016 fast food giant McDonald’s (NYSE: MCD) saw its total annual revenue decline from $27.5 billion to around $24.5 billion. During the same period net income actually rose slightly, from $4.7 billion in 2014 to $4.9 billion in 2016. Once you take into account the factors that explain the contrasting fortunes of the top and bottom lines – e.g. foreign exchange effects, increasing the proportion of franchised stores versus company managed ones, and so on – it all looks, well, pretty ordinary for a mature global company. Not much to see here I hear you thinking. However, when you look at the figures on a per-share basis you suddenly get a whole different story. Over the same period revenue per share increased by around 5%, going from $28.50 to just over $30. Earnings per share were up by almost 20%. The reason for that unusually large degree of divergence is the company’s aggressive stock buyback program. At the start of 2014 McDonald’s had a grand total of around 990 million shares in existence. By the end of 2016 that figure was down to approximately 820 million. The total bill for wiping out nearly 20% of the shares outstanding in three years? Roughly $20 billion. Now the thing about stock buybacks is they generate controversy in a way that dividends don’t. Depending on who you ask they are either a blatant tool for financial engineering or a legitimate way to return cash to shareholders. Indeed until 1982 they were actually illegal on insider trading grounds. The truth, though, is probably somewhere in between. I mean if you’re looking at a mature business generating plenty of excess capital then I don’t see much of an issue: a chunk of the cash will go towards maintaining and growing the business; the rest can potentially be split between paying down debt, cash dividends, stock buybacks, acquisitions or just letting it accumulate on the balance sheet. 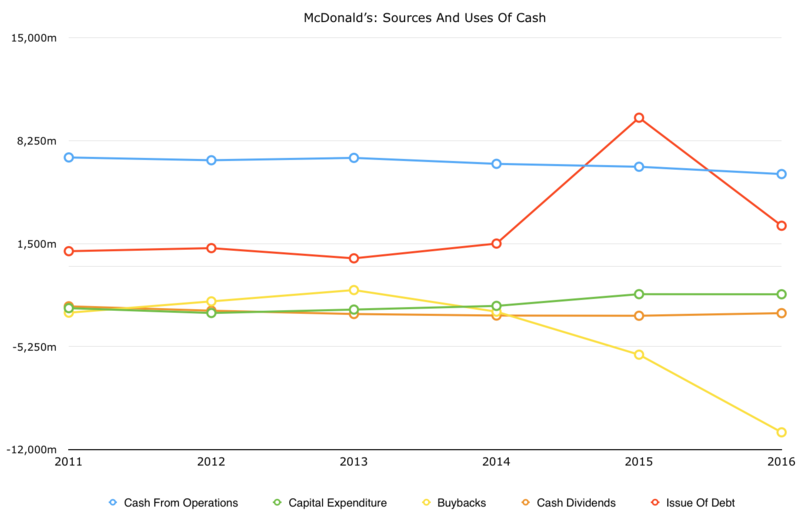 In the case of McDonald’s the level of buybacks has far exceeded the operating realities of the underlying business. If we take the 2014-2016 period in isolation then, as mentioned above, the total amount spent on stock buybacks was around $20 billion. Over the same period McDonald’s generated around $19.5 billion in cash flow from operations. If anything that actually downplays the scale of the buyback program because it ignores all the other uses of cash. For instance, McDonald’s also spent a grand total of around $9.5 billion on cash dividends during that time. Capital expenditures of over $6 billion also represented another significant cash outflow line. The upshot of this cashflow deficit has been a significant increase in the company’s net debt position. If we go back to 2010 then we find that McDonald’s was making the same $4.95 billion in net profit that it did in 2016, with total reported debt of $11.5 billion. Netting out the $1 billion or so in cash & cash equivalents gives us a net debt to profit ratio of around 2x. This year the company will probably earn around $5.35 billion in net profit, but with total outstanding debt of approximately $28 billion. Once you back out the cash & equivalents that net debt to profit ratio jumps to over 5x. The major concern I have with this trend is that the benefits seem to be disproportionally aimed at shorter-term share holders. In a strong bull market I wonder whether that’s such a good idea. 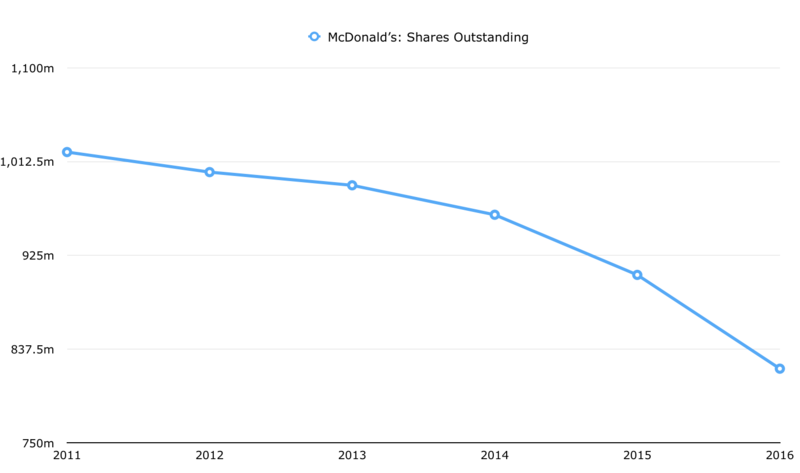 The reason I say that is because the average valuation of McDonald’s stock was around 20x earnings during the 2014-2016 period. In the previous decade the stock typically traded around the 15x annual earnings mark. In other words most of that $20 billion has been spent on buying historically expensive shares – or less bang for shareholders’ buck. The potential downsides, however, are borne by those looking a bit further ahead. At some point the company will have to align the level of cash sent to shareholders with the performance of the underlying business. When that happens anyone going down the buy-and-hold route today could be left with the awkward combination of slowing growth, a rich valuation multiple and a highly leveraged balance sheet. Time will tell how it plays out, but with management promising to return another $22-$24 billion to shareholders before 2020 it doesn’t look like those buybacks will be stopping anytime soon.